IVINS – After careful consideration, the Ivins City Council has appointed a new city manager who will potentially save the city more than $130,000 annually. The city manager position is a crucial administrative one, the person holding it follows, implements and enforces the policies set forth by the city council, including budget and laws. The manager oversees most administrative duties and day-to-day operations of the city and is held accountable by both its council and citizens. While this responsibility alone is great, Dale Coulam, Ivins’ newly appointed city manager, will be juggling the demands of both city manager and city attorney. 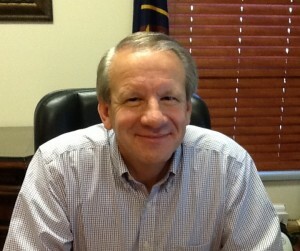 Coulam, a licensed attorney in both Utah and Nevada with 28 years of experience, has served as city attorney since 2004, handling such duties as litigation, risk management, review and drafting of contracts, drafting ordinances and overseeing city prosecution. He was appointed acting city manager in 2005 to substitute the position when necessary. Longtime Ivins City Manager Judy Gubler retired in November 2012 and the city council immediately began the process of considering replacement candidates. Coulam, recommended by Gubler herself, was at the top of the list due to his experience and intimate knowledge of the city. He proposed the idea of serving as both city manager and city attorney, which the council approved on a trial basis. Coulam’s appointment became official, effective immediately, at the council meeting on Jan. 3. The annual gross compensations of the city manager ($141,496) and city attorney ($139,097) will be consolidated into Coulam’s new salary, which is estimated at $150,000. By absorbing both positions, Coulam will save the city nearly $130,000 each year, which he hopes will enable them to fund ongoing and future projects without raising tax rates. Coulam’s altruistic attitude is nothing new to those who know him. He has long been involved in the Boy Scouts of America and volunteers as a basketball and softball coach for several local youth organizations and schools. Though born and raised in Salt Lake City, Coulam is a direct descendant of early Santa Clara settler Jacob Tobler and has strong family ties to Ivins, a community he is extremely passionate about.